Google’s news feed isn’t like Facebook. It’s a smarter, creepier Apple News. So why does it feel so impersonal? It was inevitable that Google would one day launch a news feed. The format of a feed—one nugget of information at a time, chosen for you by your friends and/or personalization software—suits the way people use mobile phones. Google’s search-result lists, in contrast, make more sense on a desktop. It was equally inevitable that said feed would be instantly compared with Facebook’s famous news feed, the standard-bearer for the form. It is an unwritten law of tech blogging that you must treat every new product as a “potential X-killer,” with X being the best-known existing entry in its general category of products. So Wednesday’s announcement brought a flurry of posts explaining what Google’s feed has in common with Facebook’s and how it differs. The comparison is warranted, insofar as they are loosely in competition each time you pick up your phone with an idle sense of generalized curiosity and few minutes to burn. (Then again, so are Twitter, Instagram, Snapchat, YouTube, and any number of other news, entertainment, and messaging apps.) It’s fair to point out that Google’s feed feels far less lively than Facebook’s and that it is unlikely ever to prove as addictive as either Facebook or any of the other apps I just named. It’s also fair to point out that it is unlikely to solve the filter bubble problem, or the fake news problem, or any other of the myriad ills for which we often blame Facebook. But after checking in on Google’s feed regularly for two days, I’ve realized that there’s a far better reference point than Facebook, both for explaining what Google’s feed is about and measuring its success or failure. 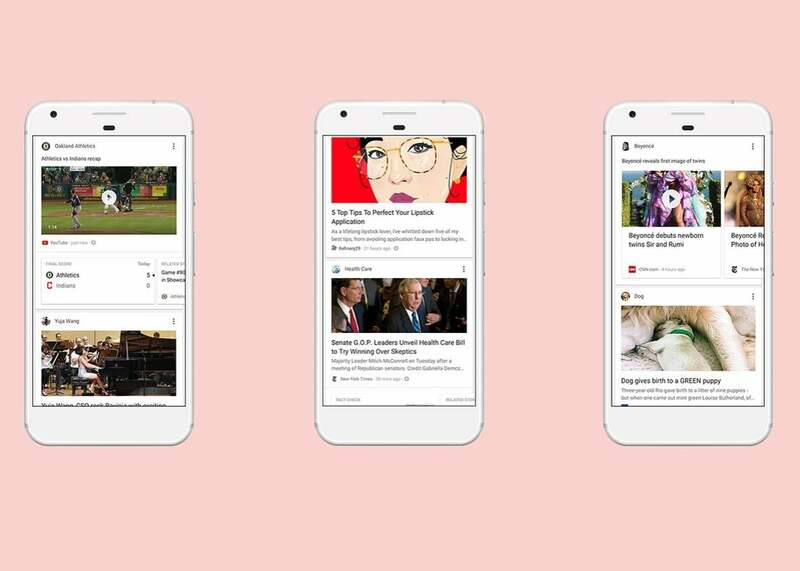 Google’s feed isn’t really the company’s answer to Facebook; it’s an answer to Apple News. That implies both a different use case and a different place in the online media sphere than the one Facebook dominates. Yes, Facebook’s news feed has news in its name, and it contains news stories among its varieties of content. But at its core, it’s a social app. It’s about interacting with people you know. Sometimes those interactions revolve around news stories; other times around photos, videos, or personal status updates. But, contra an oft-misquoted statistic, most people don’t really open Facebook in order to read the news, at least in the traditional sense of the term. They open it to see what’s going on in their social circles—what people are doing and saying, both about one another and about the wider world. It’s less like opening a newspaper and more like attending a cocktail party. That Facebook has become such an influential news source is a testament to the power of its core insight about human nature: We care far more about what our friends are saying and doing than we do about the goings-on of strangers, celebrities, or public figures. And so people spend so much time on Facebook that they end up reading more news there than they do on actual news apps or sites, even if that wasn’t what drew them to open it in the first place. Google’s feed, like Apple News, really is primarily about news and information. And, perhaps perversely, that is likely to constrain its popularity and importance as a distributor of online news. Technically speaking, both Google’s feed and Apple News are personalized, in the sense that some combination of algorithms, engineers, and product managers have conspired to select the specific stories you see. 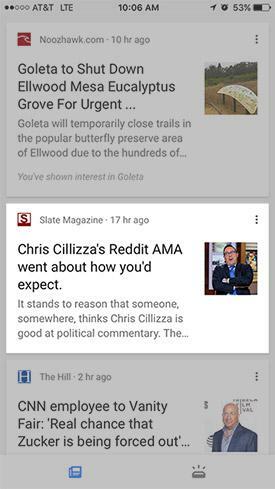 In fact, Google’s feed represents a significant step up in personalization from Apple News. It harnesses a powerful data set—Google’s records of your online behavior, including your search history—with what feels like a pretty aggressive machine learning–powered personalization engine. Whereas Apple News and other news apps (think Flipboard) have often exercised a light touch with the personalization, striving for a magazinelike blend of timely topics that loosely correspond to your interests, Google’s feed goes for the jugular from the get-go. The first time I opened it, one of its top recommendations for me was an article I had written myself just the day before. This turned out not to be an aberration. Google’s recommendations for me so far have homed in directly on my core search interests: media criticism; fake news; Fox News; social media; Elon Musk; artificial intelligence; Donald Trump; baseball; and Goleta, California, where I recently moved. Colleagues tell me they’ve also been impressed, and in some cases a little creeped out, by its suggestions. Copy editor Dawnthea Price, a gamer in her spare time, told me her feed served her posts on Final Fantasy 15, Pokémon Go Legendary, and a real-estate listing for a house in her neighborhood (!). Assistant managing editor Megan Wiegand, a trail runner, was recommended an episode from a running podcast she had never heard of. Yet if Google’s feed borders on uncanny in its personalized targeting, it still feels fundamentally impersonal compared with the likes of Facebook. That’s because it lacks a social component: It delivers the topics you care about but not the people you care about. (Incidentally, so did the ill-fated Google Plus, which Google actually did explicitly pitch as a Facebook rival.) In many ways, the likes of Google’s feed and Apple News feel even less personal than reading your local newspaper or watching a newscast, because they lack a cohesive ethos, let alone a face or a voice. None of this to say that Google’s feed won’t prove useful, popular, or significant as a driver of online traffic and information. The startling accuracy of its recommendations quickly earned it a place in my regular app rotation—but not a central place. Like Apple News, it’s something I skim when I want a quick update, rather than a place to get lost in or a feed to grow addicted to. Without the promise of someone you know saying or doing something shocking, inspiring, or maddening, there’s simply no dopamine rush when you tap on it. If human nature were a little different, we might all be content to spend our spare hours reading sober news and commentary, carefully tailored to our interests and brought to us by reputable, professional sources. Human nature being what it is, Facebook doesn’t have much to worry about.